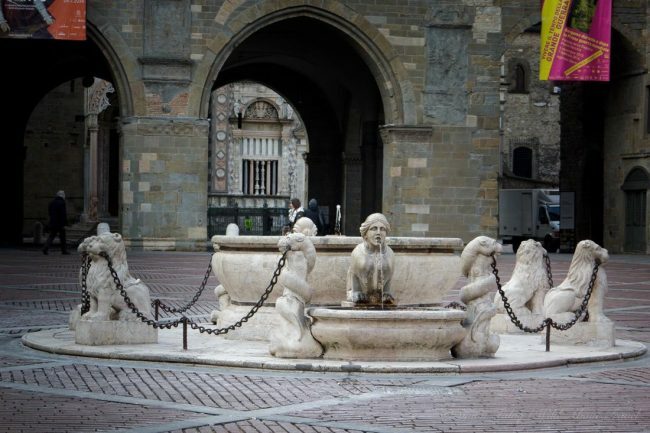 To many European travelers visiting northern Italy, Bergamo is just an airport, a gateway to other Italian cities. There are even tourists flying in and out the same day just for shopping. But there are plenty of things to do in Bergamo, a beautiful medieval town yet often underrated. Sitting on the foothills of the pre-alps, close to Milan and Lake Garda, Bergamo is one of the most charming towns of the Lombardy region. 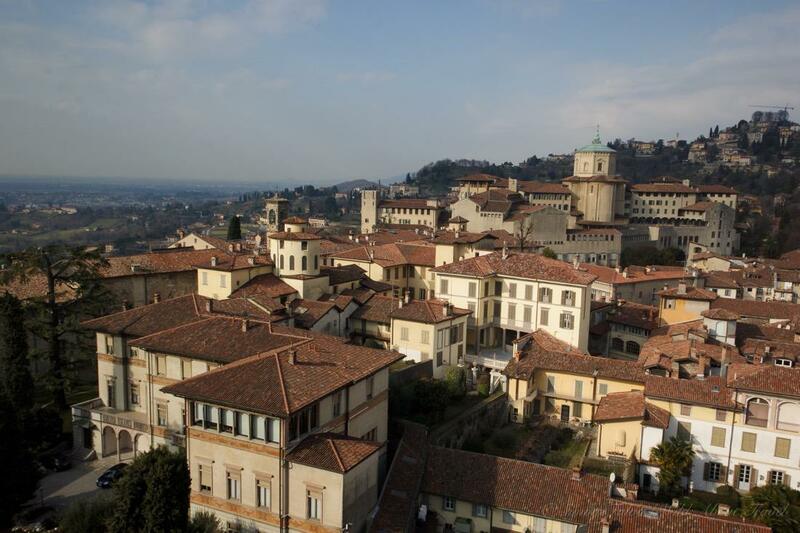 Once in Bergamo, you’ll wonder why this beautiful little city is not yet on the radar of any Italy lover radar. Indeed, Bergamo is split in two. The contrast between the modern lower Bergamo, laying on a plain, and the ancient town, sitting on a steep hill, is striking. 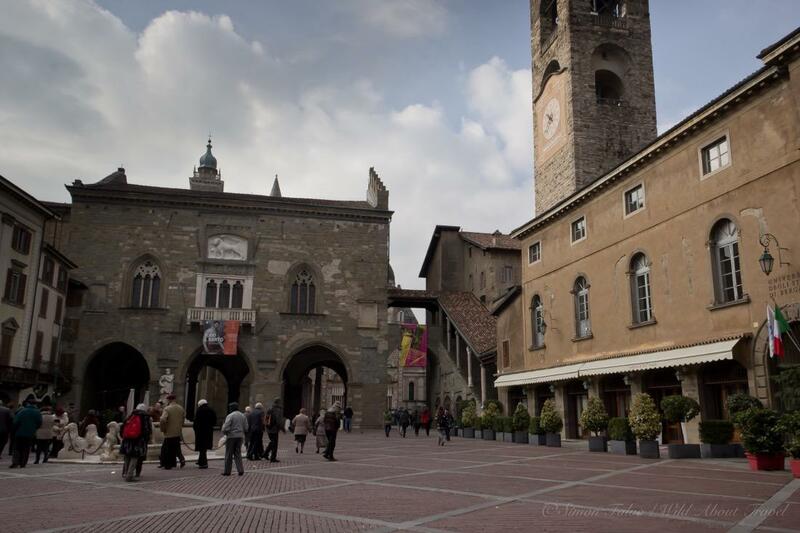 The Venetian walls and their four monumental entrance gates divide the two parts of Bergamo. Bergamo Alta, as the old “upper town” is called in Italian, might be small, but there’s a lot to see. 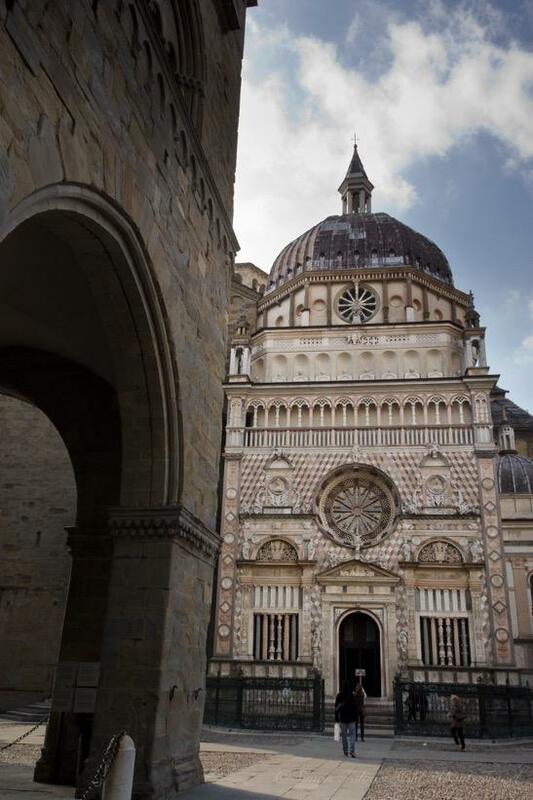 Here are my recommended things to do in Bergamo, for a memorable day. 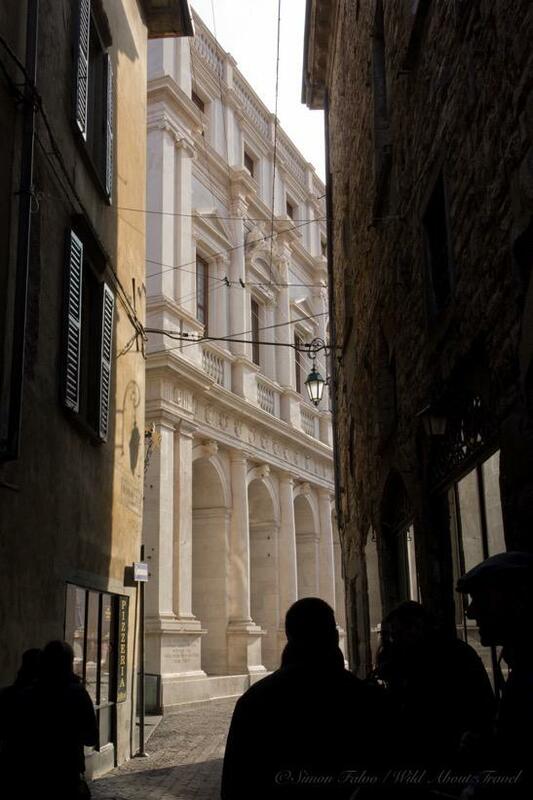 Whichever direction you walk, even without a map you’ll soon find yourself in Piazza Vecchia. 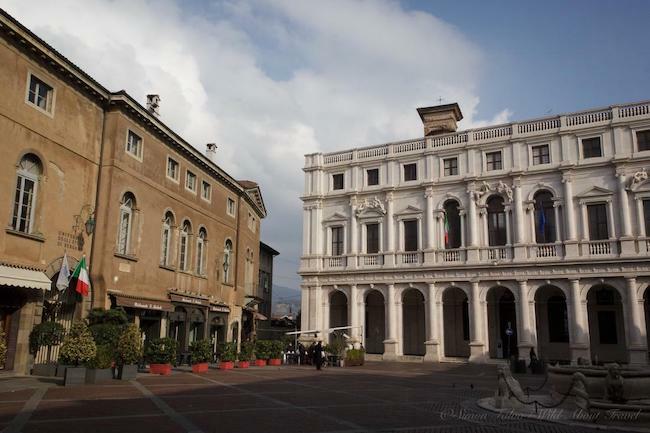 You’re in the heart of Bergamo “upper town” and at one of the most beautiful squares in Lombardy. Surrounded by magnificent buildings and landmarks spanning from the Middle Ages to the late Renaissance, you’ll hardly know where to look first. Indeed, the white classical Palazzo Nuovo (home of the Angelo Mai library hosting an impressive collection of old books), the sober medieval Palazzo della Ragione, the bell tower, also called Campanone and, at the centre of the square, the Contarini fountain – encircled by mysterious sphinxes -, all combine in pure harmony. Walking under the pointed arches of the Palazzo della Ragione you’ll reach the small, asymmetric Piazza Duomo. It will only tak you a glance to see more astounding buildings. Unlike Milan’s cathedral, whose imposing facade overlooks a large square emphasizing the sculptures and the spires which seem to stretch toward the sky, the entrance to Bergamo’s cathedral is so squeezed in the tiny square that it’s barely noticeable. During the Middle Age, Piazza Duomo was the religious and political center of the city. Therefore, this small square hosts some of the most important landmarks. 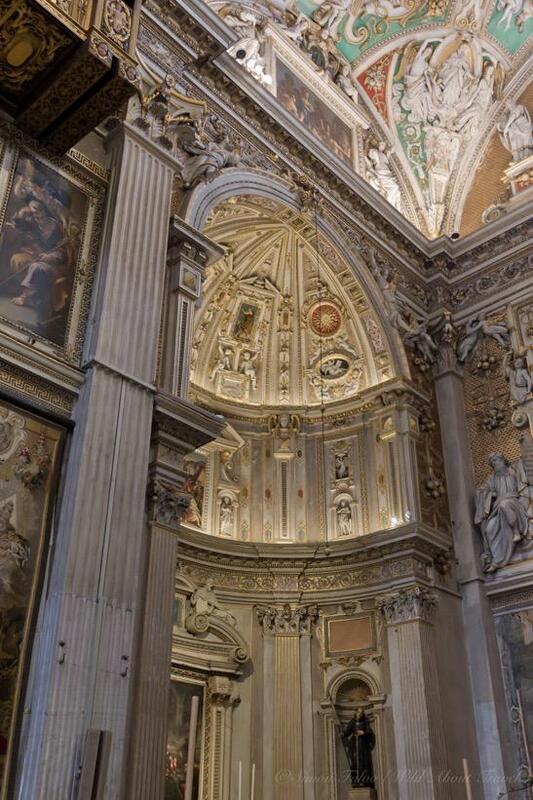 However unassuming the bare medieval entrance of the Basilica di Santa Maria Maggiore may seem, the grandiosity of its interior and the beautiful frescoes decorating the walls and the dome will blow your mind away. According to the popular tradition, a vow done to the Virgin to protect Bergamo from the plague led to the decision to build Santa Maria Maggiore, whose erection started in 1137. During the following centuries, the Basilica was progressively enlarged and beautifully decorated with sculptures, tapestries, and frescoes. If you’re passionate about music, have a look at Gaetano Donizetti’s tomb. 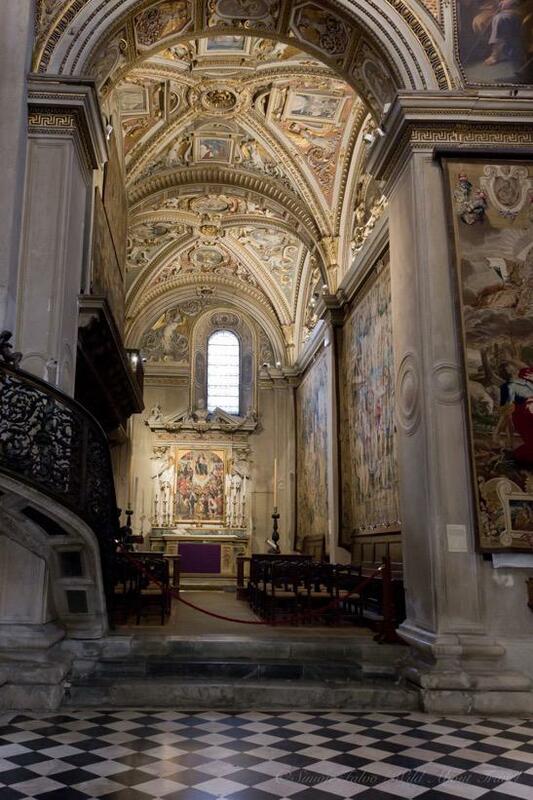 Adjacent to the basilica is the Colleoni Chapel, probably one of the most famous buildings in Bergamo. Bartolomeo Colleoni, a condottiere from one of the most outstanding families in the area, commisioned the mausoleum. The erection of the Chapel, housing the tombs of Colleoni and his beloved daughter Medea, took place between 1472 and 1472. The polychrome facade, with its white, red and black intarsia, and the exquisite sculptures and columns, is a masterpiece of late Renaissance art. Inside the chapel, the white funerary monument dedicated to Medea strikes for its classical and serene composition, and the way the sculptures stand out from the background of black and white lozenges. 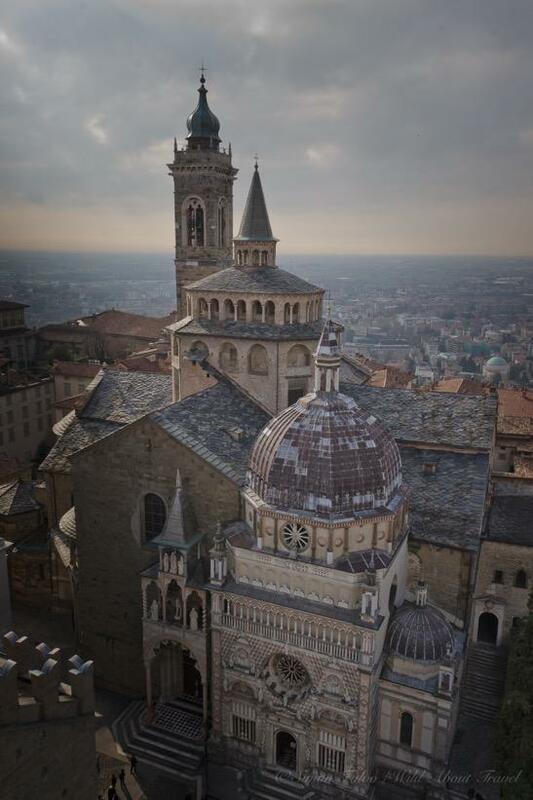 Unless the weather is awful, one of the best things to do in Bergamo is climbing the bell tower (there’s also an elevator if you prefer avoiding the stairs). From the top of the Campanone, you have a 360 degrees view of Bergamo and a stunning perspective on the Colleoni Chapel and the old town. As you look top down, rather than the opposite, you might be reminded (I am, very often) that this is one of the most important aspects of life: being able to look at things from opposite angles. 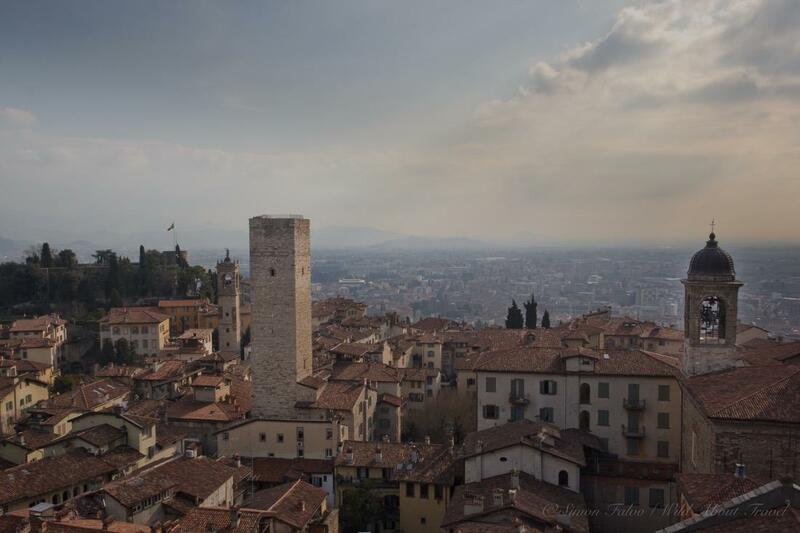 Walking on the tower, you’ll also discover Bergamo’s context: the “lower town” and the plain on one side, the foothills and the pre-Alps on the other. From this elevated viewpoint, you get an idea of this geographic area, in between the alps (further north) and the plain. Bergamo Old Town is small, and there’s no better way to enjoy it than strolling through the charming cobblestone streets. Let your eyes wander around. Look at the pretty shops, spot fascinating old signs reminding of the time before neon. 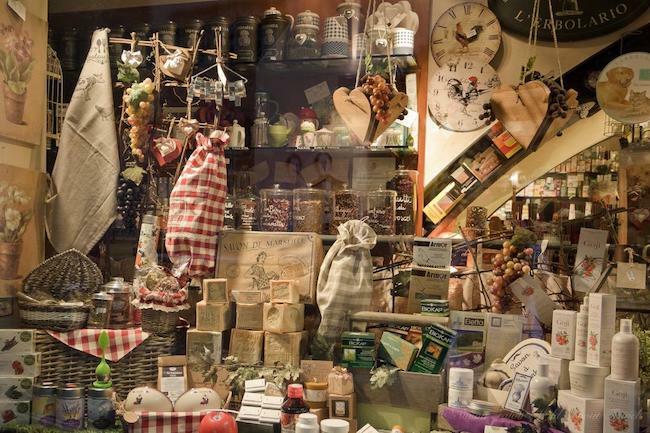 Similarly, savor the elegant ancient bakeries and pastry shops, with their beautifully displayed food specialties. 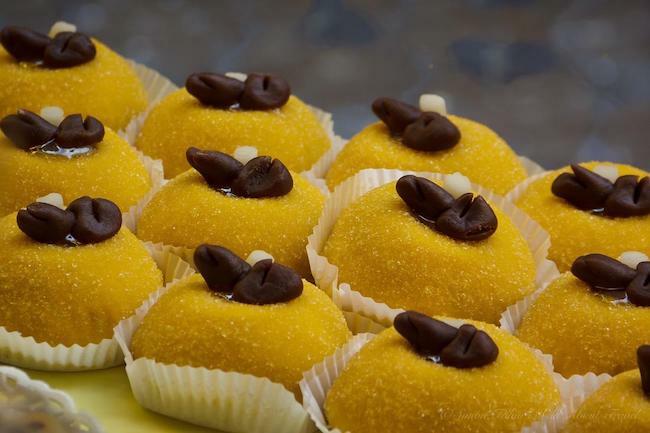 Lastly, don’t miss having a look at polenta e osei – literally polenta with birds – a local pastry which is very pretty to see although, at least to my taste, way too sweet. Unless art and museums give you a skin rash, you shouldn’t miss to visit the outstanding Accademia di Carrara. 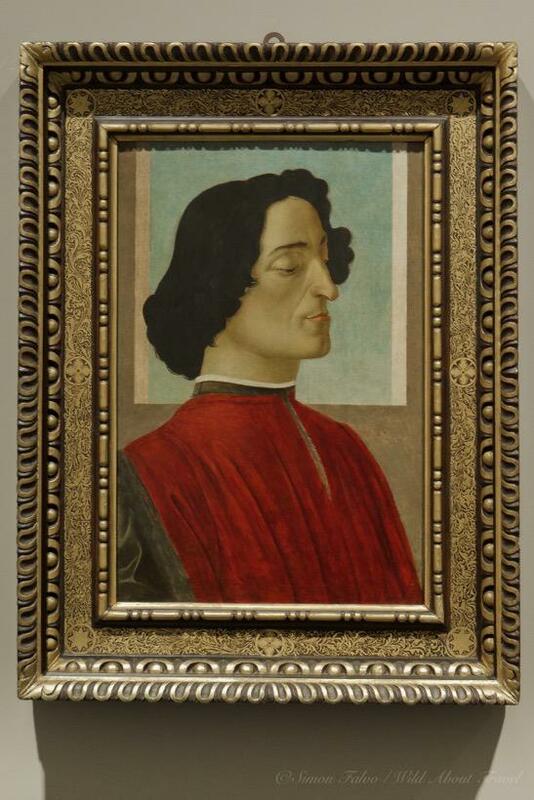 Compared to the Uffizi in Florence, the Vatican Museums in Rome, or the Ducal Palace in Venice, this art collection is much smaller, but it showcases amazing masterpieces from the late Middle Ages and early Renaissance and is a must-see for art lovers. Among the things to do in Bergamo, you can’t miss a walk along the Venetian Walls. A UNESCO World Heritage Site, the Venetian Walls were erected in the sixteenth century by the Republic of Venice to defend the city from enemy attacks. The 5 km long path offers beautiful views of the city. Moreover, on a particularly clear day, you can even see as far as Milan. Enjoy the trip on the funicular which for over 120 years connected the new and the old Bergamo. Once there, continue your journey with the second funicular from Bergamo old town to the San Vigilio hill. From San Vigilio, you’ll discover more beautiful views. 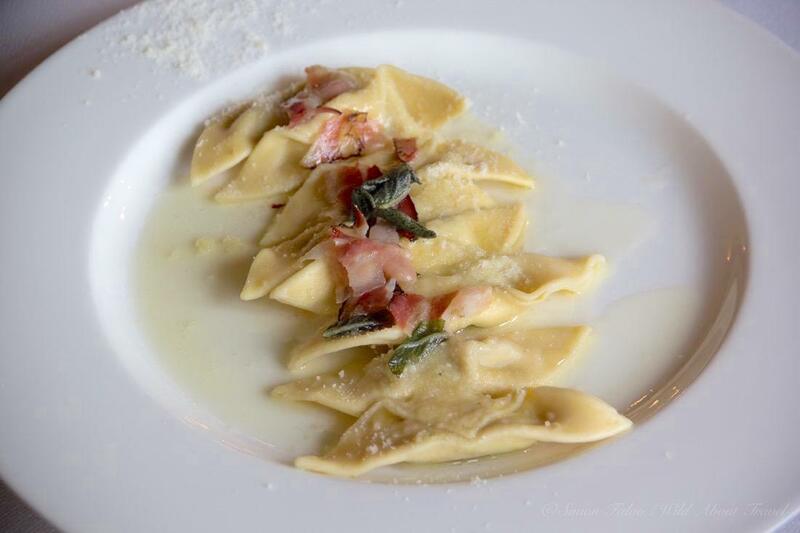 If you like pasta, you can’t miss eating Casoncelli. These home-made ravioli filled with beef, bread crumbs, egg, parmesan cheese, sausage, and seasoned with melted butter and sage are divine. and the Donizetti cake, dedicated the famous opera composer, a native from Bergamo. If you have the chance, don’t miss to taste the local Moscato di Scanzo, a rare meditation wine, and heaven in a glass. Orio al Serio International airport has a large number of flights, mostly operated by low-cost carriers, connecting Bergamo with many cities throughout Europe. Check-out the schedules and the cheapest flights options here. From Orio al Serio, a regular bus service (every 20 minutes) connects the airport with Bergamo train station and the upper town. Alternatively, you might consider renting a car if you want more freedom. From Milan, regional trains leave regularly from Milano Centrale and Milano Porta Garibaldi. The journey takes about 50-60 minutes. 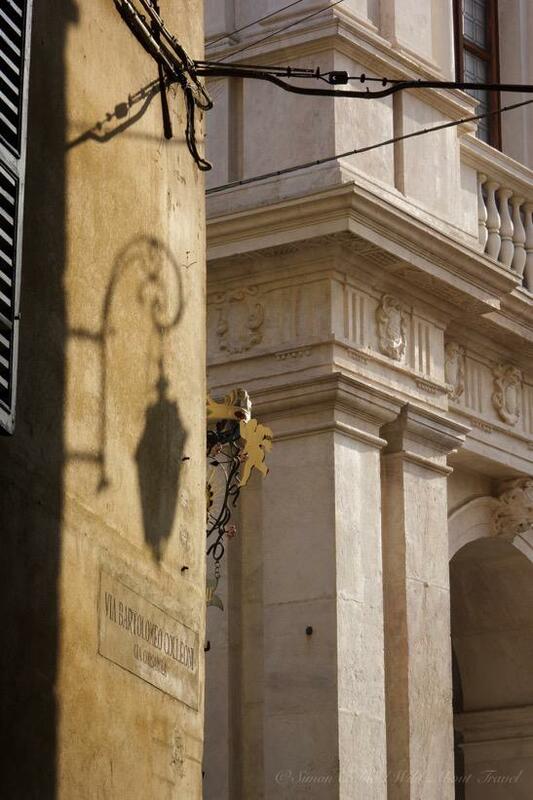 The stylish Relais San Lorenzo, in the old medieval city, is the perfect choice for a romantic getaway. You can indulge yourself at the Spa. And you can enjoy a special treat at the gourmet restaurant and its unique setting within an archaeological site. Modern and stylish, the boutique Hotel Petronilla in lower Bergamo had a small fitness and wellness center and is only a few steps from the shopping district and the bus stop. 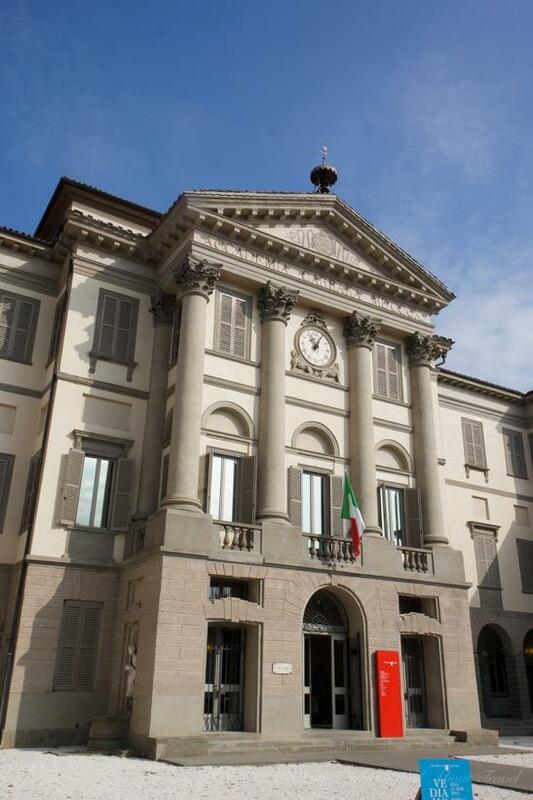 The Gombit Hotel is in the heart of Bergamo old town. It features a design decor in an old building, giving it a boutique-style vibe. Search for -> more accommodations in Bergamo. Ristorante Hostaria, in the old town, is a gourmet restaurant set amid old ruins and has a unique atmosphere. Warm and cozy, La Tana serves local dishes in a lovely décor. Vineria Cozzi, in the heart of Bergamo old town, is another popular restaurant for locals and tourists. 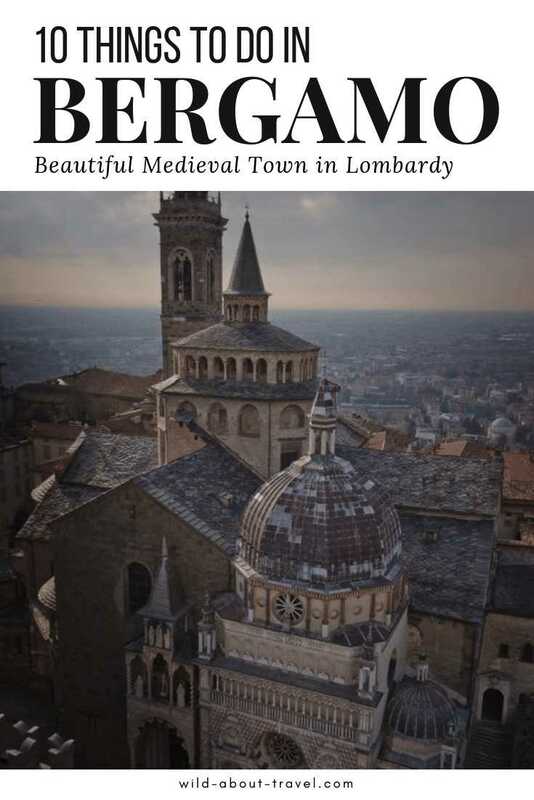 You can easily visit Bergamo as a day trip from Milan, taking a tour, with a guide leading you through Bergamo most beautiful attractions and landmarks. On a short or long trip, I never leave without travel insurance. I was glad to have it when I had to go to the dentist in New Zealand. Note: This article was written in the context of the #inLombardia365 campaign, created and managed by iambassador in partnership with Lombardy Tourism. As always, Wild About Travel retains all editorial control. This article contains affiliate links to carefully selected services. If you purchase one of them, I get a small commission at no extra cost for you.